ArchGynecol Obstet 2012 Feb 8. Oxidative stress is implicated in the pathogenesis and/or maintenance of elevated blood pressure in hypertension. This study investigated the effect of honey on elevated systolic blood pressure (SBP) in spontaneously hypertensive rats (SHR). It also evaluated the effect of honey on the amelioration of oxidative stress in the kidney of SHR as a possible mechanism of its antihypertensive effect. SHR and Wistar Kyoto (WKY) rats were randomly divided into 2 groups and administered distilled water or honey by oral gavage once daily for 12 weeks. The control SHR had significantly higher SBP and renal malondialdehyde (MDA) levels than did control WKY. The mRNA expression levels of nuclear factor erythroid 2-related factor 2 (Nrf2) and glutathione S-transferase (GST) were significantly downregulated while total antioxidant status (TAS) and activities of GST and catalase (CAT) were higher in the kidney of control SHR. 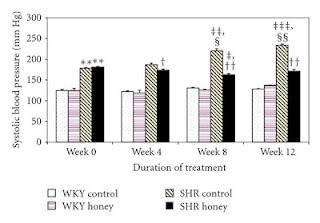 Honey supplementation significantly reduced SBP and MDA levels in SHR. Honey significantly reduced the activities of GST and CAT while it moderately but insignificantly upregulated the Nrf2 mRNA expression level in the kidney of SHR. These results indicate that Nrf2 expression is impaired in the kidney of SHR. Honey supplementation considerably reduces elevated SBP via amelioration of oxidative stress in the kidney of SHR. Beneficial effect of honey has been widely reported particularly on wound healings, gastrointestinal disorders and as antibacterial agent. 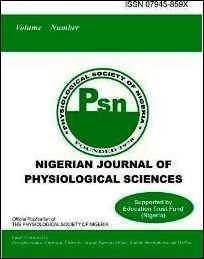 However, there is paucity of report on its cytoprotective effect on the gastric mucosa despite its common usage worldwide including Nigeria. This study was therefore carried out to evaluate the effect of this widely consumed substance on gastric mucosa using animal model and also to explore possible mechanism of its action on the gastric mucosa. Twenty male adult albino rats of Wistar strain, weighing between 210-220g were used in the experiment. They were randomly assigned into two groups, the control group and the honey-fed (test) group, each containing ten rats. The Control group was fed on normal rat feed and water while the test group was fed on normal rat feed with honey added to its drinking water (1ml of honey for every initial 10ml of water for each rat daily) for twenty two weeks. After twenty two weeks the rats were weighed after being starved overnight. They were anaesthetized with urethane (0.6ml/100g body weight). Gastric ulceration was induced using 1.5ml acid-alcohol prepared from equivolume of 0.1NHCl and 70% methanol introduced into the stomach via a portex cannula tied and left in place following an incision made on the antral-pyloric junction of the stomach. The acid-alcohol was allowed to stay for 1hr. After 1hr, laparatomy was performed and the stomach isolated, cut open along the greater curvature, rinsed with normal saline and fastened in place with pins on a dissecting board for ulcer examination and scores. The result obtained showed mean ulcer scores of 14.5+0.70 for the control group and 1.6+0.11 for the test group. The result showed that honey significantly reduced ulcer scores as well as caused scanty haemorrhage in the test group compared with increased ulcer scores and multiple haemorrhage in the control group. It is therefore concluded that honey intake offered cytoprotection on the gastric mucosa of albino rats. In order to study the antifungal activity of propolis ethanol extracts (PEE) from Apis mellifera bees from Mexico we used optical microscopy and we were able to see that PEE induced inhibition of germ tube formation of C. albicans. In summary, we succeeded in establishing the chemical content of propolis, with a significant presence of flavonoid type compounds, a prerequisite for such high activity. Similarly, we must remember that the characteristic flora of each region determines the type of propolis bees collect in that locality, and this accounted for the differences in the antimicrobial activity which we found in this study. 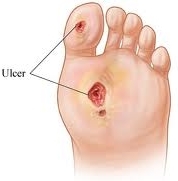 Foot ulcers and infections are the major sources of morbidity in individuals with diabetes mellitus. This study aimed to evaluate the efficacy of topical Royal Jelly (a worker honey bee product) on healing diabetic foot ulcers. Diabetic patients with foot ulcers that were referred to our clinic at Khorshid Hospital, Isfahan, Iran; were evaluated three times a week and treated according to standard treatments consisted of offloading, infection control, vascular improvement and debridement if required. In addition, all ulcers were measured and then topical sterile 5% Royal Jelly was applied on the total surface area of the wounds. Eventually, they were covered with sterile dressings. Each patient was followed for a period of three months or until the complete healing. A total of eight patients were enrolled in this study. Of these, two had two ulcers and, therefore, ten ulcers were evaluated. Two ulcers were excluded. Seven of the remained eight ulcers healed. Mean duration of complete healing was 41 days. One ulcer did not completely heal but improved to 40% smaller in length, 32% in width and 28% in depth. The mean length, width and depth reduction rates were 0.35 mm/day, 0.28 mm/day and 0.11 mm/day, respectively. Royal Jelly dressing may be an effective method for treating diabetic foot ulcers besides standard treatments. Since propolis and phenolic compounds, such as cinnamic and coumaric acids, have several biological properties, their immunomodulatory effect on cytokine production (IL-1β, IL-6 and IL-10) was investigated. 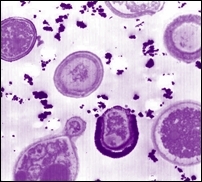 Peritoneal macrophages from BALB/c mice were incubated with propolis, coumaric and cinnamic acids in different concentrations and the concentrations that inhibited cytokine production were tested before or after macrophage challenge with LPS, to evaluate a possible immunomodulatory action. Propolis and the acids stimulated IL-1β production, while IL-6 production was significantly inhibited after incubation with propolis (5, 50 and 100 µg/well), coumaric and cinnamic acids (50 and 100 µg/well). In LPS-challenge protocols, inhibitory concentrations of cinnamic and coumaric acids after LPS incubation prevented efficiently its effects on IL-6 production, whereas propolis inhibited LPS effects both before and after its addition. Propolis, coumaric and cinnamic acids (50 and 100 µg/well) inhibited IL-10 production as well. Both acids showed a similar inhibitory activity on IL-10 production when added after LPS challenge, while propolis counteracted LPS action when added before and after LPS incubation. Propolis modulated the immune/inflammatory response, depending on the concentration. Its efficiency may occur due to the synergistic effect of its compounds, and cinnamic and coumaric acids may be involved in the action of propolis on cytokine production. Using headspace solid-phase microextraction (HS-SPME) followed by diethyl ether and methanol extraction, it was possible to isolate as many as 185 organic compounds out of 17 samples of crude royal jelly (RJ). Of the above compound number, 169 compounds were positively identified by means of gas chromatography-mass spectrometry. The volatile fraction of RJ consists of 25 different compounds where approximately 47% of the total ion current (TIC) of volatile compound chromatograms were composed of substances characterized by bactericidal (phenols) and repelling (octanoic acid and 2-heptanone) activities. Preliminary investigations have shown that RJ stored for 10 months at -18°C and 4°C keeps its composition of volatile compounds unchanged, however, at the same time at room temperature RJ phenol contents is decreased twice, whereas the fraction of aliphatic acids is increased 2.8 times due to the presence of both acetic and butyric acids. The chromatogram of RJ ether extracts showed 85 different compounds, however about 88% of TIC consisted exclusively of 8 compounds, i.e. 10-hydroxy-2-decenoic, 10-hydroxydecanoic, 3,10-dihydroxydecanoic, 8-hydroxyoctanoic, 2-decene-1,10-dioc and (Z)-9-hydroxy-2-decenoic acids. Nine aliphatic acids, which were detected for the first time, are the homologues of hydroxy- and oxo-acids identified earlier in RJ. In the RJ methanol extracts 82 compounds were identified, mainly carbohydrates and their derivatives. Approximately 87% of TIC consisted of fructose, glucose and sucrose. Special attention was paid to discrepancies between obtained and literature data concerning the presence of free amino acids in RJ. It was suggested that these inconsistencies can be explained by the differences in the methods of RJ collection and/or sample preparation. ► Volatile compounds of fresh royal jelly. ► Bactericidal and repelling activities. ► Markers of inappropriate storage. ► Extractable compounds of royal jelly. ► Possible source of free amino acids. Several compounds with antibacterial activities were identified in honey. However, a mechanism by which they lead to bacterial growth inhibition and bacterial death remains still unknown. We recently found that honeys possess DNA degrading activity mediated by honey hydrogen peroxide and an unknown honey component(s). Here we provide evidence that active honeys (MIC90 of 6.25% to 12.5% v/v) possessed significantly higher levels of phenolics (p<0.02) of higher radical scavenging activities (p<0.005) than honeys of average activity. Removal of H2O2 by catalase eliminated bacteriostatic activities caused by both phenolics and H2O2 suggesting that the growth inhibition resulted from the coupling chemistry between these compounds. Both phenolics and H2O2 were involved in DNA degradation by honeys. Treatment of plasmid DNA with H2O2 alone did not affect the DNA integrity but H2O2 removal from honey by catalase prevented DNA degradation. Polyphenols extracted from honeys degraded plasmid DNA in the presence of H2O2 and Cu (II) in the Fenton-type reaction. The extent of DNA degradation was inversely related to the polyphenol concentration in this system as well as in honeys. 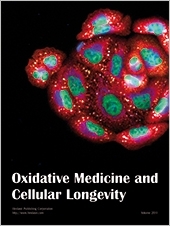 At low content, honey polyphenols exerted pro-oxidant activity damaging to DNA. In conclusion, honey phenolics with pro-oxidant activities were necessary intermediates that conferred oxidative action of H2O2. Phenolic/H2O2-induced oxidative stress constituted the mechanism of honey bacteriostatic and DNA damaging activities. ► A coupling chemistry between polyphenols and H2O2 was the mechanism underlying DNA degradation by honey. 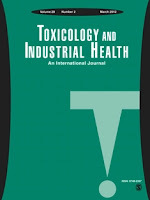 ► Honey polyphenols emerged as active intermediates that were necessary to confer oxidative action of hydrogen peroxide. ► The antioxidant/prooxidant properties of honey polyphenols play a critical role in bacterial DNA degradation. The statistics speak for themselves - honey heals better than SSD treatments used on burn patients - 18 days vs 32 days! In fact, the methodology is completely different. Typical burn unit protocols include scrubbing the wounds, a painful and scarring effect, aimed at keeping bacterial counts low. Honey dressing treatments allow wounds to remain moist, minimizing scarring. While it may appear unattractive, the antibacterial and anti-inflammatory properties of honey keeps wounds germ-free and speeds healing. The aim was to evaluate the effect of honey dressing and silver sulfadiazene (SSD) dressing on wound healing in burn patients. We retrospectively reviewed the records of 108 patients (14-68 years of age), with first and second degree burns of less than 50% of the total body surface area admitted to our institution, over a period of 5 years (2004-2008). Fifty-one patients were treated with honey dressings and 57 with SSD. 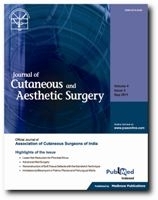 Time elapsed since burn, site, percentage, degree and depth of burns, results of culture sensitivity at various time intervals, duration of healing, formation of post-treatment hypertrophic scar, and/or contracture were recorded and analyzed. The average duration of healing was 18.16 and 32.68 days for the honey and SSD group, respectively. Wounds of all patients reporting within 1 h of burns became sterile with the honey dressing in less than 7 days while there was none with SSD. All wounds treated with honey became sterile within 21 days while for SSD-treated wounds, this figure was 36.5%. A complete outcome was seen in 81% of all patients in the "honey group" while in only 37% patients in the "SSD group."